It takes months—sometimes even years—of planning to create the 11 minutes of magic that each corps delivers at the World Championships. This three part series—published in the winter issue of Drum Corps International Magazine—goes behind the scenes to see how four top corps put the pieces together in the off-season to produce the programs fans will see performed on the football field this summer. Read part I: The design meeting. Read part II: Divide and conquer. Putting the Pieces Together Around the end of May, most ensembles begin three to four intensive weeks of "spring training." 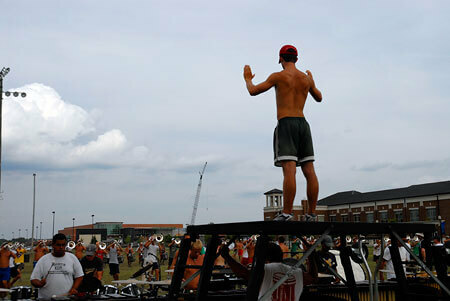 Phantom Regiment first holds section camps, where brass, percussion and color guard sections each work on their own. After a full week of section camps, the official spring training kicks off Memorial Day weekend, with all the sections coming together for three weeks. "That's where we finish learning the show and get things ready to go on the road," says Dan Farrell, Phantom Regiment program director. You just go crazy over the space of three weeks with these intense rehearsals and that's how you finally get the whole product on the field. "You just go crazy over the space of three weeks with these intense rehearsals and that's how you finally get the whole product on the field," Cadets director George Hopkins says. Every show continues to evolve, however, even after the actual season begins in June. "Memorial Day to the first week of June, we'll finish it up, we'll see a final product," Blue Devils executive director David Gibbs says. "That's when we start 'Version 2.'" Farrell says Phantom Regiment will evaluate its show after the first week of the season and figure out what's working and what isn't. "By the third or fourth week, we're already well into getting those changes taken care of. It's our goal to be done 'playing' with the show three weeks before the DCI World Championships." According to Hopkins, the Cadets are "notorious" for changing. "We'll change it up until two weeks [before the Championships]. I try to schedule three or four shows in a row and then two days off." For the Blue Devils, Gibbs says he schedules entire chunks of time as "change weeks." Hopkins acknowledges that the Cadets, like other corps, often hold things back. "The adjudicators see us many times, sometimes six, seven, eight times. Something that's very entertaining or surprising in June is not so surprising in August when they're seeing it for the eighth time. You lose that initial thrill. So we try to keep things out, and we add things in as we go through the season." The Cavaliers work through new changes during an ensemble rehearsal block. Audience reaction can also point out a show's weaknesses, even when the judges don't. "There are times when the judges might not be complaining," Farrell says, "but you were expecting a reaction and you didn't get it: It's time to go back and figure out why." Ultimately, each corps' brain trust must balance the equation between competitive success and artistic expression. "We certainly think about what place we end up in and what we can do to rank higher," Farrell says. "But we also want to do a program that conveys our version of drum corps, something that we can be excited about and that will play to our fans and our potential members." Read part I: The design meeting. Read part II: Divide and conquer.